Right on. I don't claim original ownership of the combo either obviously; I think it's a fairly popular one as you said and the differences really boil down to creature choice. I just didn't want my comment to come across as "you picked the wrong creatures" or anything, because you've got some real nasty ones in there as well. I just find the consistency of Annihilate to be rather dependable (since it triggers on attack especially, even a 'return/exile attacking creature' or whatever still won't be enough to come back from losing that many permanents early on. If you're going to keep your other power creatures in there and just splash some Annihilate for diversity, I'd recommend adding in 4x Pathrazer of Ulamog since not only is he Annihilate 3 instead of 2, but the other two on my list there don't have useful abilities apart from being large Annihilate creatures. Artisan of Kozilek won't even trigger the way the deck plays, and forced attack on Ulamog's Crusher isn't exactly against the strategy of the deck anyway, but if you have a choice I figure why bother. 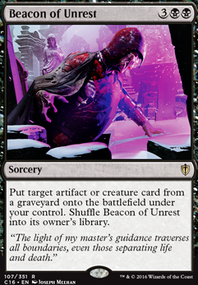 Those are the highest Annihilate ability creatures that don't have a function where they cycle to the library when they hit the graveyard (ick). Still, with all of that being said, I'm jealous of your Iona. Good stuff...I hope you can put at least one or two of my suggestions to use with her. Good Luck! Hey, love the deck. Please do not take this comment as being elitist in any way, but it looks like you've got a very similar strategy to my deck: "Very Fast Death Factor (Budget Speed Dredge). While your creature choices are pretty devastating, the speed at which you pull them means (in my opinion) Annihilate creatures are a better bet. It doesn't really matter whether an opponent can cast or not when you're attacking with Annihilate 2 or 3 on Turn 3. Pathrazer of Ulamog , Artisan of Kozilek , and Ulamog's Crusher are the creatures I chose to use this mechanic on. Giving you a +1 for this deck regardless, but again check out my deck called Very Fast Death Factor (Budget Speed Dredge) if you want some inspiration/overview of my method. Since Nikya is your commander, you can play 12 mana creatures the turn after he comes out, and that's impressive. Here's a few budget options. Ancient Stone Idol , Darksteel Colossus , Desolation Twin , Pathrazer of Ulamog , Artisan of Kozilek , Ulamog's Crusher , It That Betrays , Primeval Protector . Some other fun cards are hydras like Heroes' Bane , Polukranos, World Eater , and Primordial Hydra . Some more creature ramp is Burnished Hart or even Wild-Field Scarecrow if you wanted. 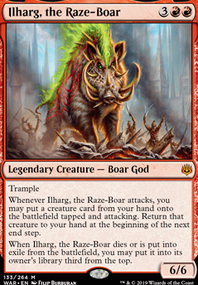 For a creature heavy deck, I highly suggest Garruk's Horde , Vizier of the Menagerie , Primordial Sage , and Soul of the Harvest . I think that Pack Rat is a good creature to contain the aggro decks during the firsts turns if you can't reanimate the Pathrazer of Ulamog or it is in your hand, and it's also good to feed the graveyard.You may cut 2 Stinkweed Imp, 2 Tasigur, the Golden Fang or any other spell to put 2 or more Pack Rats. For the sideboard you may put 2 copies of Tormod's Crypt, Ratchet Bomb and Damping Sphere; 3 copies of Nature's Claim over Naturalize and cut 1 Duress and 1 Gurmag Angler. 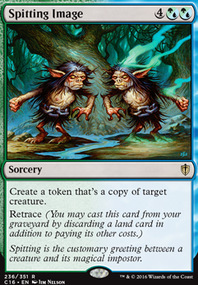 And about the reanimation spells, the only cheap reanimation I find spell in modern is Goryo's Vengeance, but it is much expensive for a budget list. 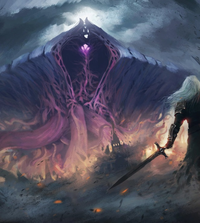 Pathrazer of Ulamog is pretty good, as well as Void Winnower. I know many can't afford them but Ulamog, the Infinite Gyre, Ulamog, the Ceaseless Hunger, Emrakul, the Promised End, and Kozilek, Butcher of Truth are the best colorless creatures to cast with your commander. Charcoal Diamond and Rakdos Signet are good ramp spells.